Martin Hansen discovered what became known as Hansen Cave in October 1887, reportedly while cutting timber he tracked cougar footprints high up the side of American Fork Canyon. Unfortunately, many of the features and formations in this chamber were damaged or removed by the Duke Onyx Company and the general public before the cave was made a national monument. In 1913, a second cave was discovered nearby. While in the area to explore Hansen Cave with their families, James W. Gough and Frank Johnson were climbing an adjacent slope when they discovered the entrance to what is now known as Timpanogos Cave. 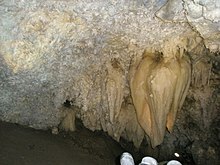 Several others later entered the cave and viewed many of the formations inside, including the Great Heart of Timpanogos. However, before long knowledge of the cave and its entrance was lost. Some sources indicate that the entrance was lost due to a landslide in the area, while others say it was, in part, caused by the extreme secrecy of the original finders. Several years later, after hearing rumors of another cave, Vearl J Manwill came with a group of associates (which later became the Payson Alpine Club) in search of the mysterious hidden cave. On 14 February 1921 he rediscovered it (although many sources credit him as having discovered the cave). He immediately shared the information with the other members of the group. Having in mind the extreme damage that had resulted in Hansen Cave, that very night, the group dedicated themselves to the preservation of the cave. Of that night, Manwill wrote in his journal that they discussed ways "to preserve its beauty for posterity instead of allowing it to be vandalized as Hansen's Cave had been." Shortly thereafter they reported their find to the US Forest Service. Later that fall, on 15 October 1921, George Heber Hansen and Wayne E. Hansen, Martin Hansen's son and grandson, were hunting on the other side of the canyon. While using binoculars to try to find deer, they came across another hole in the mountain, in between the other two caves. In a few days they came back, with 74-year-old Martin Hansen. Martin was the first to enter the cave, now called Middle Cave. Although the site was designated a national monument on October 14, 1922, the site was initially developed and maintained by the U.S. Forest Service. The National Park Service took over management in 1933. A number of park structures were built by the Works Progress Administration in the 1930s and early 1940s. The Timpanogos Cave Historic District was designated in 1982 to include these structures. 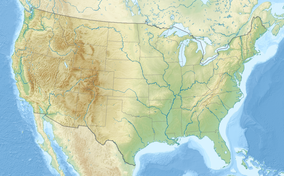 The cave system is located in the Deseret Limestone, a Mississippian age limestone formed around 340 million years ago. Notably the cave cavity was formed initially by a series of faults running off of the Wasatch fault. Since that time hydrothermal water action perhaps similar to that of Cave of the Winds in Colorado, and uplift of the Wasatch Mountains has formed the modern cave system. The speleothems first started to form within the last 750,000 years, based on paleomagnetism of iron deposits within the formations, as the cave system has been slowly lifted above the American Fork River.